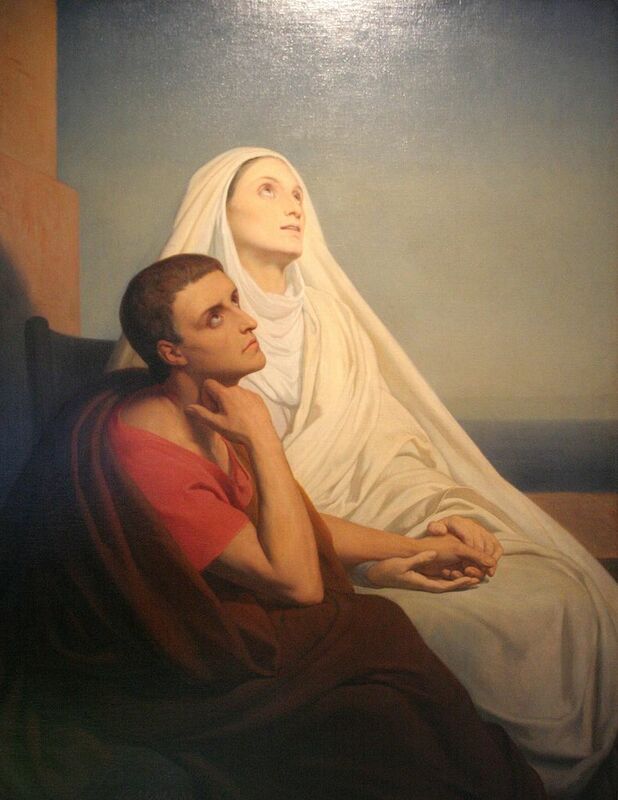 St. Monica with her son, St. Augustine. This week we celebrate two saints who belong to the same family. More incredibly, one is responsible conversion of the other. We're speaking, of course, about St. Monica and St. Augustine. St. Monica was born in Tagaste, which is now Algeria. Because of her name and place of birth, Monica is assumed to have been of Berber origin. She was married early in life to Patritius who held a government position in Tagaste. Patritius was a pagan, though like so many at that time, his religion was no more than a name; his temper was violent and he appears to have had a life of dissolute habits. Monica had a hard life, but was not the only matron of Tagaste whose married life was unhappy. Through her sweetness and patience, she served as a good example amongst the wives and mothers of her native town; they knew that she suffered as they did, but remained peaceful and patient. Her words and her action had a great effect on those around her. St Monica had three children: Augustine the eldest, Navigius the second, and a daughter, Perpetua. Monica had been unable to secure baptism for her children, and she experienced much grief when Augustine fell ill. In her distress she asked Patritius to allow Augustine to be baptized; Patritius agreed, but when the boy recovered he withdrew his consent. Augustine had been sent to Carthage to study, and during that time he led a bohemian life. He converted to Manichaeism, a Persian, Gnostic religion. When he returned to visit his mother and told her about the founding of this religion she kicked him out of the house. It is said she later experienced a strange vision that convinced her to reconcile with her son. After seventeen years of resistance Augustine finally converted to Christianity, but not before his mother followed him to Rome and Milan where, with the help of Saint Ambrose, she put Augustine on the path to holiness. Despite the rocky start he became one of the most important saints in the catholic tradition. He is even considered a Doctor of the Church because of his writings. Everything started because his mother never gave up; she always believed that her son could be holy. Augustine built his faith on his mother faith and inspired millions who read him and feel drawn to Christ. So these two saints are an example of how we are all called to be holy.